Browsing through my BWOF back issues, I found this knit empire waist tee maternity pattern, 08-2005-123, that looked like the perfect piece to help get me through the next 3 months. Seeing this style, though, reminded of a Jalie pattern that I've had in my stash, yet to make. Jalie 2804 just won a place in Pattern Review's top 10 patterns of 2009, and while it's not marketed specifically as a maternity top, it's said to be appropriate for that purpose too, and ever since I first saw these pics of Emilie during her pregnancy (check out pg 3 for top 2804 in a white sleeveless version), I mentally filed it away as a promising pregnancy pattern. Since the two patterns are fairly similar, one designed as maternity wear, one winning accolades from seamstresses all over the internet, I decided to make both as a "compare and contrast" study, with the thought that I could take my favorite pieces/features of each top and morph them into one uber-fabulous pattern. 100% cotton knit from Denver Fabrics. For the "real thing", I would certainly use a knit with lycra for better recovery, but the 100% cotton worked for the test garments. Jalie 2804 - I cut an S based on my pre-pregnancy measurements. This is my first Jalie pattern so I figured I'd just start there. BWOF 8-2005-123 - I cut a 38 since that's my regular BWOF size. Here's the Burda mag model photo. It's a little more fitted and actually looks decent. Nothing like mine! Maybe if I went down 2+ sizes? Jalie, on the other hand, is golden in my book right now! I need to go up a size or two because, frankly, this top makes me feel slightly like a sausage in casing, but that I can deal with, especially once some lycra is added to the mix. Yup, new Jalie fan over here *waves hands*. Good thing too because I just bought their new cardigan, leggings, and the criss-cross top! The criss-cross top seems to have mixed reviews, but it's said to be good for nursing, and the pregnant model on the envelope looks good in hers so I'll see if I can make it work for me. Needless to say, I won't be morphing these two patterns into one. I'm just going to work straight from the Jalie. I found this great blog post by Morzel that shows how to turn 2804 into a nursing top, so that's my eventual plan. Jalie Criss Cross would work as maternity, I made it for me and with my shape after all these kids, it looked maternity. I also use it for my 8 year old daughter with good results. I love the Jalie top over the BWOF, but you are not done growing yet, so you may want to use really stretchy knit or add a bit to the "skirt" part. Holy Toledo! That's tremendous. I'll have to give Jalie a go. The Jalie top looks great! Perhaps I should try out one of the Jalie patterns I've had marinating around here for awhile. I think there is another Jalie fan! I love their patterns for both tops and bottoms. Thanks for the comparison. You definitely are the "cutest pregnant lady ever"!! Take care. The Jalie is definitely a winner. It looks great on you. Oh, great review! Most helpful to do a comparison. I haven't bought any Jalie patterns yet, but I have been eyeing them off for a while, so maybe now is the time. I have put a link below. It is to a page on drafting a tanikini top, but if you scroll down to step 8, it shows you how to modify a tankini for pregnancy. 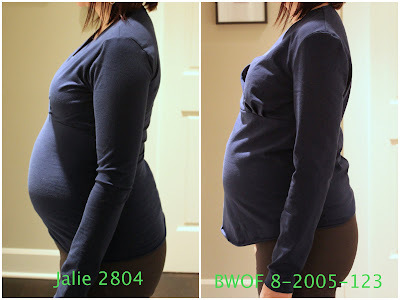 I thought the information may be useful if you wanted to modify knit tops for pregnancy. The second link has a bit of a discussion of the body changes during pregnancy. Wow, what a difference! I know which one I'd sewing and which one I'd be giving a funeral. Wow! That's a major difference. That's a very interesting compare and contrast study! Good for you! Erm yes no contest there really! Surprising result though for Burda, thanks for testing the patterns. Oh, look at your love bump. You look so adorable. 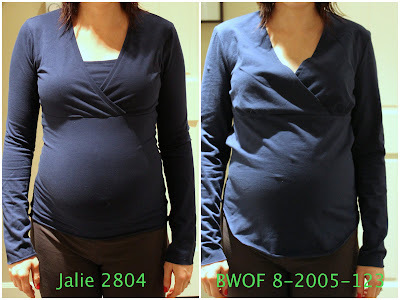 The Jalie top is perfect, I like the fitted look for maternity clothing. Yea, I agree a size up and you'll feel more comfortable. Well done and remember to rest. Oh my goodness! What was Burda thinking? Jalie wins hands down. Thumbs down on the Burda. Models for patterns have their clothes pinned in the back to make them look as if they fit perfectly. They don't. You look great in the Jalie top! The Burda... seriously, WTF? Thanks so much for doing this post. The Jalie top looks like a serious winner! I'll have to go buy me some cute knit fabrics and get sewing. Wow, that really is a big difference! The Jalie top is very Pregnancy Chic. Oh what a difference! But the Jalie top looks great! Oh my! That Burda is SO sad! That said they do have larger shoulders and stuff, but it should fit if it's your regular size! The Jalie looks great. The Jalie top looks awesome. I just errased the burda pattern from my list. Thank you for testing it. I made the criss cross top from jalie - for nursing, 2+ years ago (despite reviews, I liked them and they fit well, I believe I wrote a review of these on PR) and I wore them again through about 26 weeks before they got too short/tight. However, at 30w I look bigger than your 38w photo. I may just have to get this jalie pattern and make one before I deliver and expect to use it postpartum, too. Thanks for this information about Empire crossover tops. Great post! *Gasp* that BWOF is a car wreck! Thank goodness I blundered upon your post, because I have the same pattern on my cutting table. Last year I tried the the maternity V-neck tee in the 8/06 issue, which also looked like a car wreck: a vast, underfilled, sagging, deflated air bag in front of me--even at 40 weeks. I'm sold! Just ordered my first Jalie and can't wait to start sewing. Daughter in law is 5 mos pregnant and moaning that she can't find any maternity clothes to fit her barely-five-foot frame.